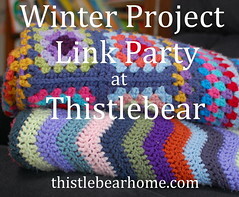 Welcome to December's Winter Project Link Party! I hope you'll want to join me in sharing your current winter projects (or recent finishes) and cheering each other on to progress. This month, I'm sharing a stash-buster I started right after I finished Maybelle in November. I couldn't have predicted it, but I actually felt the itch to crochet again almost immediately. I had lots of I Love This Yarn worsted-weight acrylic in my stash from previous blankets and I had been wanting to clear it out for a while. I decided to make a blanket for the living room! I could really use a new one in there; the ones I have were made when I started crocheting in earnest about six or seven years ago. I like them, but I'm tired of them, and besides, they're both a bit small for our needs. I want to make one large blanket, and if I have enough yarn left over, I might make a smaller throw too. For this first blanket, I chose to make large solid-colored granny squares joined in cream, really simple and graphic; back to basics, really. Here is what I've done so far. These squares are about 12 inches apiece, so the blanket is growing very quickly. Each has eleven rounds (including the cream-colored joining round), made on an I/9 hook. My plan calls for thirty squares total (arranged 5 by 6), which will give me a blanket about 5 by 6 feet before adding a border. I think this will be plenty big enough, but I can always add more squares if needed. I really like this blanket so far. The colors are great because they're all my favorites that I've stocked up on over the years, and I love the look of solid-colored granny squares; they allow texture to be as important as color. I'm literally joining as I go, one square at a time, which I've never done before. Normally, I make all the squares first, and then have a big joining event at the end. I felt like changing my approach this time, though. These squares are simple and fast to join, and since they're so large, the blanket takes shape right away, which has been really satisfying. I love having a blanket grow down my lap as I work on it, but that can take some time. This blanket is an instant grower. I try to make an hour or so in my day for crochet and I'm usually successful, even if the hour is broken up in small parts here and there, or even if I have to crochet while giving spelling dictation or drilling in math facts. These squares are perfect for my crochet-time allotment because I can typically make and join one square in about an hour's time. I'm trying a new technique for the squares, which is pretty exciting. I came across a square pattern on a blog called knitpurlhook, which taught me some new things that make granny squares way easier, especially if you're making them in just one color. I'd always turned my squares with each round to avoid getting a "twist" in the work, but this blogger's technique has you joining the rounds in a corner, and only adding one chain in each corner, which keeps the work straight. And you don't have to cut the yarn and start again on another side. It's a great technique, I recommend it highly. This blanket is really filling the bill for me right now, with holiday nuttiness ramping up. There's nothing like a simple, nearly-mindless project to give you a little peace and relaxation. Watching your stash dwindle is a pretty good feeling too. It's looking lovely already, such pretty colours. I agree that it's satisfying using the join as you go method and seeing the blanket grow as you're working on it. I’m loving the colors that you’re using in this blanket Jennifer. I’ve actually been thinking of using up some of my scraps in a blanket similar to this or actually probably several toddler size blankets similar to this, for the crisis nursery. I’m thinking maybe I wouldn’t make my squares so large for smaller blankets. For the size blankets you’re making yours are absolutely perfect. Thank you for sharing the new method of making squares to. I’m going to look at that link. Your new blankie looks great, Jennifer. I'm off to look at that link now but that's the way I do my granny squares too. You turn yours to come back around? How fascinating! I might need to try that to see how it looks! I will definitely give that granny square method a try. It sounds interesting. I love your colors, they are very calming. My Cozy Stripe blanket is my stash buster project. It feels good to use up what I have. The blanket is looking great. lovely blanket..... :) love the colors!!!! The new blanket is looking great Jennifer! It's good to challenge ourselves with new techniques, and it looks like it's all working out for you in this blanket. The colours are beautiful, and they're all tied together with that lovely cream border. Two thumbs up!